This submersible sensor & instrument selection guide will help you discover the most appropriate product for installations where the instrumentation will be completely submerged in water or other type of liquid. In addition you will find information to help you with the terminology and specification parameters used to define IP68 rated submersible measurement instrumentation. Measurement instrumentation for permanent immersion in boreholes, reservoirs, rivers, coastal waters, ocean and liquid storage tanks. Underwater Pressure Sensors- Pressure sensors for installing underwater which are constructed to prevent water entering sensitive components and causing damage to the sensor. Submersible Diesel Tank Level Sensors- Diesel fuel oil storage tank device for measuring liquid level and converting it to an electrical signal to send to other instrumentation protected from diesel ingress when completely immersed in the fuel oil. Submersible Leachate Level Transmitters- Sensing transmitter devices protected from liquid ingress when completely immersed in a leachate for measuring leachate level and converting it to a 4-20mA current output signal to send to other instrumentation. Landfill Site Submersible Leachate Level Transmitters- Sensing transmitter devices protected from liquid ingress when completely immersed in a leachate for measuring leachate level and converting it to a 4-20mA current output signal to send to other instrumentation on a landfill site used to bury waste material. Submersible Liquid Level Sensors- Devices protected from liquid ingress when completely immersed in a fluid for measuring liquid level and converting it to an electrical signal to send to other instrumentation. Marine Approved Submersible Liquid Level Sensors- Marine approval certification for use on ships. Protected from liquid ingress when completely immersed in a fluid. Device for measuring liquid level and converting it to an electrical signal to send to other instrumentation. Submersible Hydrostatic Level Sensors & Probes- Level sensors for submerging permanently in liquid to determine the level or depth of fluid by measuring the hydrostatic pressure. Plastic Submersible 4-20mA Liquid Level Sensors- Plastic based chemical resistant casing material, protected from liquid immersion, 4 to 20 mA current output signal liquid level sensor. IP68 Submersible Protected Voltage Output Signal Pressure Transducers- Voltage signal out pressure transducers protected to IP 68 ingress protection rating for immersing in water or other compatible liquids. Submersible Pressure Transmitters- Select a 4-20mA current loop output sensor for submerging underwater to measure liquid level, water depth or pressure of submerged equipment. Sea, Brackish or Salt Water Submersible IP68 Depth & Level Sensors- IP68 rated transmitters and transducers suitable for use with tidal and coastal salt water. Water Resistant Pressure Sensors with Strain Gauge Output- Water resistant strain gauge output pressure sensor for measuring hydrostatic liquid level or underwater system pressures. Fresh water sensors & instruments for submersible use in environmental monitoring, water utilities, boreholes, reservoirs and other applications involving the submersion into to clean potable drinking water. Wastewater submersible sensors & instruments for installing in sewage treatment systems, landfill sites and other industrial waste management sites. Water tight sensors & instruments made from materials that have a high corrosion resistance to sea water. Chemical resistant submersible sensors & instruments for use with caustic chemicals such as acid & alkaline solutions. Low range level measurement probes & instruments for measuring depth of rivers, stream and liquid level in small storage tanks. High temperature protected submersible probes and instrumentation with electronics, housing and cable designed to be immersed in hot liquids. Intrinsically safe approved IP68/NEMA 6X sensors for immersing in tanks on sites where instrumentation must be certified for use in hazardous areas contain volatile substances such as oil refineries, fuel depots, landfill sites and sewage treatment works. Marine approved & certified sensors & instruments for submerging in marine vessel liquid storage tanks. Small diameter submersible probes for use in narrow boreholes for applications such as hydro-logical site surveys & groundwater testing. Customisable low cost submersible probes for OEM design applications. 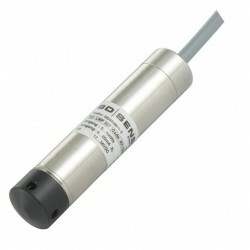 Temperature measurement submersible probes for measuring liquid temperature. A submersible device can be installed in liquid without causing any damage as long as the installation instructions are adhered to, and the specified depth and time duration limits for submersion are not exceeded. Assembled devices are vulnerable to liquid ingress, which can enter the device through seals and joints or permeate through components that incorporate thin membranes or porous materials. To achieve a long lasting submersible construction, the device is constructed from materials which will not easily corrode when exposed to a fluid. Corrosion may cause the material to fail and allow liquid to enter the device, or interfere with the seal joining the corroded material to another component. The seals used to join device components together are pressure leak tight, resilient to the expected temperature variations and resist corrosion from the surrounding fluid. All components and seals are designed to withstand the pressure expected at the maximum required liquid depth, and this may involve a series of seals and backfilling with a potting compound or other fill material to improve longevity and reliability at greater depths. Articles with more information on using and selecting submersible measurement instrumentation. Why are Submersible applications so demanding of Pressure Transducers? Send us your enquiry for a product associated with this Submersible page, and get assistance with selecting a product for your application.